Can the police search a guest in a home when executing a search warrant? Can The Police Search Me If I Am A Visitor In A House? A search warrant for a particular location gives the police broad authority to search within that location for evidence of contraband like drugs, guns, and other incriminating items. There are, of course, limits, and in Pennsylvania, even searches which are supported by a warrant may be subject to challenge with a Motion to Suppress. In addition to the possibility of attacking the legality of the warrant itself, there may be other grounds for suppressing the results of a search even if the police had a warrant in cases where the police officers exceed the scope of the warrant. For example, even when the police have a search warrant, the authority to search is generally limited to areas within the property where the police could reasonably expect that the evidence being sought could be found. For example, if the police are looking for guns, then they could not search a container which is too small to contain a gun. Likewise, the police probably could not search the contents of your computer in order to find a gun unless the search warrant specifically gives them authority to analyze the data on the computer. Philadelphia Criminal Lawyer Zak T. Goldstein, Esq. An important issue arises when there are guests present in a home when the police show up to execute a search warrant. As a general rule, the police may not search the physical person and clothing of the people in the home unless those people are identified in the warrant or the police have other independent probable cause to arrest those people and conduct a search incident to arrest. This means that if the police have a search warrant for the house, and you happen to merely be there when the police show up to execute the warrant, then the police may not search you and the clothing that you are wearing merely because they have a warrant for the house. If you are described in the warrant or they have existing probable cause to arrest you, then they could search you, but if you happen to merely be a guest in a property which is the target of a search warrant, the police do not have the authority to search you without more than just the warrant. The issue becomes trickier when there are items of clothing or bags which could contain the contraband being sought which are not physically on the person in the house. This was the situation which arose on appeal in a recent case in the Superior Court, Commonwealth v. Petty. In Petty, the defendant officers were executing a search warrant for drugs on a house in Philadelphia. Mr. Petty happened to be a guest in the house, and when police entered the house, Petty was in bed in the rear bedroom. Unfortunately for Mr. Petty, he did not have his pants on. Police ordered Petty out of the bed, and as Petty complied and tried to put on his pants, which had been lying on the floor, police first took the pants before Mr. Petty could pick them up and searched them, recovering drugs. Petty’s criminal defense lawyer filed a motion to suppress the drugs, alleging that the police in effect had searched his person because the police knew that the pants were his. Because police had no prior information on Petty, this search would have exceeded the scope of the warrant because Petty was not identified in the warrant. Therefore, police did not have authority to search Mr. Petty or his clothing. Holding that clothing removed from a person and placed nearby is an extension of his person rather than simply an article of personal property on the premises interjects an element . . . that requires police to guess whether items in proximity to a person not identified in a warrant would soon be used by that person. Because Appellee did not physically possess the pants when officers found them, police were authorized to search them. 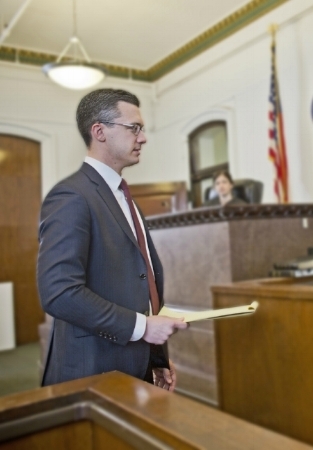 Our Philadelphia Criminal Defense Lawyers offer a 15-minute, complimentary criminal defense strategy session. We know that picking up the phone and calling an attorney can be intimidating, so in this video, Attorney Goldstein explains what you can expect when you call us. Call 267-225-2545 to speak with one of our criminal defense lawyers. Although Petty lost on appeal, the Superior Court’s decision reaffirms the holding that police may not search guests in a home merely because they have a warrant to search that home. As always, if you are facing criminal charges, it is critical that you hire a criminal defense attorney who focuses his or her practice on criminal law and stays on top of new developments in the law. If you are facing charges in Pennsylvania or New Jersey, call 267-225-2545 for a free 15-minute criminal defense strategy session with one of our award-winning Philadelphia criminal defense lawyers. Older PostIs Mace a Deadly Weapon Under the Aggravated Assault Statute?